Home / Publications / Finance: Servant or Deceiver? Finance: Servant or Deceiver? 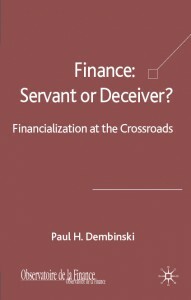 Financialisation at the Crossroad, Prof. Paul H. Dembinski, Palgrave Macmillan, 2009, 179 pages. The work of the Observatoire de la Finance over the past ten years has shown that the continuing spread of financial logic through society is the result of a converging set of factors: the development of technology and, more generally, of wealth-creating capacity, a growing dread of risk and the unforeseen as living standards increase, finance’s theoretically based claim to guarantee the West a peaceful future, the challenges and aspirations of countries in the South with regard to economic and social development, and so on. In the course of the Observatoire’s research it has become clear that the psychological, philosophical and moral dimensions of finance are as important to a proper understanding of it as are its economic, technical and institutional aspects. It is these avenues that the Observatoire has explored over the past decade. The result today is an epistemologically coherent conceptual framework that has been used to help draw up a systemic diagnosis. The diagnosis, which is the subject of this book, reveals that behind the conspicuous expansion of finance a systemic transformation, referred to here as ‘financialization’, is in fact taking place. PART III : FINANCE – WHAT KIND OF SOCIETY DO WE WANT? Chapter 3.3 WHAT IS TO BE DONE?